The market analysis and consulting firm’s latest data report was released to clients earlier in the week, detailing all of Australia’s woodchip, log and sawnwood trade movements for 2018. “Last year, 2018 was the biggest year ever for Australia’s hardwood chip exports,” Tim Woods, managing director of IndustryEdge told Daily Timber News. Mr Woods focussed in on the second half of 2018, saying that the September quarter saw exports total 1.733 million bdmt. Alongside the 1.824 million bdmt exported in the December Quarter, exports in the second half amounted to 3.557 million bdmt. As an example, Mr Woods explained that in 2018, 79 woodchip export vessels passed through Portland in Western Victoria alone. Portland may be the largest export facility, but as IndustryEdge’s reporting demonstrates, others are also pushing out large volumes. “The three Bs – Bunbury, Burnie and Bell Bay – all had big years too,” Mr Woods said. 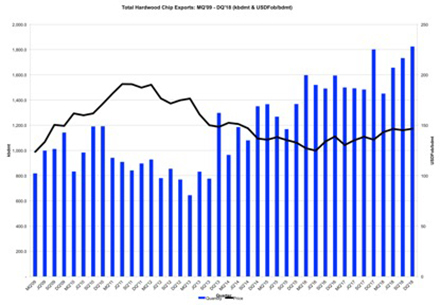 There do not appear to be any storm clouds on the horizon, with respect to export volumes, according to Mr Woods, but the price growth of the last year is unlikely to be repeated in 2019. Deliveries to China were up 7.9% in 2018 but down 2.5% to Japan, a further indication of the importance of the Chinese market, as well as the significance of maintaining a diverse supply into the global market for hardwood chips. Every month, IndustryEdge publishes Wood Market Edge, Australia’s only forestry and wood products market and trade analysis, and supplies its customers with hundreds of unique data products, advisory and consulting services.